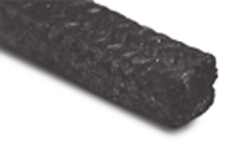 Carbon fiber yarns with inconel wire insertion are square-braided. Anticorrosive material is treated. Suitable for high temperature & high pressure valve packing. Mainly used in combination with JIC 4101.